A childhood flight of fancy or a parent's worst nightmare? A father yaks it up with another parent in a city park while his young son wanders off. The curious little boy pursues a pigeon right out of the park and deep into the heart of the unforgiving city. There's a desperate search as the child runs across busy streets teeming with traffic and climbs to the top of a water tower before collapsing from exhaustion. As the day ends and hope fades, a miraculous rescue is made and the child is returned to his devastated mother. In an ironic twist, the end of the tale finds the father and son at the park again. This time the child is constrained by a common leash as his father continues to blather on with his friend. The child's safety is secured... but at what price? Unlike his friend the pigeon, Luke shall never fly again. Of course that's how I read it; through adult eyes. But LUKE ON THE LOOSE wasn't written for me. It's for kids who see the fun in something as simple as racing after a pigeon. My daughter, for instance, laughed at all the chaos Luke caused throughout his pursuit. More importantly she recognized how reckless he was being. That's what made it all so hilarious. 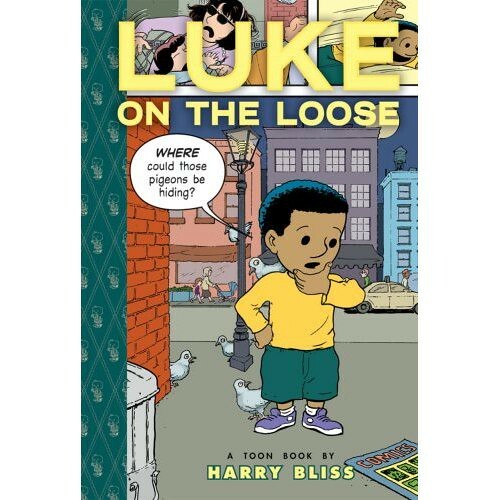 Compared to the rest of their catalog, LUKE ON THE LOOSE is a bit weak. Toon Books puts a lot of effort into crafting quality comics for beginning readers. But LUKE feels more like a modified picture book. Harry Bliss, an accomplished childrens book illustrator, could stand to polish his comics skills. He hasn't completely captured how the narrative is supposed to flow from panel to panel. The book looks more like a series of illustrations hammered into comics form. What he does bring is a thorough knowledge of comic book canon. Look for the famous characters, such as Hulk and Captain Haddock, lurking throughout the city. All in all this is still a fun time for kids who enjoy a little chaos. Which is to say, any kid at all.